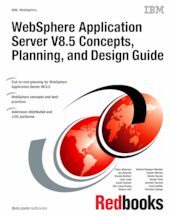 This IBM® Redbooks® publication provides information about the concepts, planning, and design of IBM WebSphere® Application Server V8.5 environments. The target audience of this book is IT architects and consultants who want more information about the planning and design of application-serving environments, from small to large, and complex implementations. This book addresses the packaging and features in WebSphere Application Server, and highlights the most common implementation topologies. It provides information about planning for specific tasks and components that conform to the WebSphere Application Server environment. Also in this book are planning guidelines for Websphere Application Server and Websphere Application Server Network Deployment on distributed platforms. It also includes guidelines for WebSphere Application Server for IBM z/OS®. This book contains information about migration considerations when moving from previous releases. This book has been updated with the new features introduced with WebSphere Application Server V8.5.5.